If wireless, 'bodily' MIDI control is on your agenda, you need to check it out. Software is very intuitive. Easy setup. Works as you'd expect. We're not overly convinced by the strap's durability. A 'wearable' motion controller 'ring' for use with a Mac or PC running any MIDI-receiving software, the Hot Hand USB responds to movement on the X and Y axes (ie, towards/ away and left/right), as well as Z (up/down). The package comprises a USB receiver dongle, the ring itself and a power supply for charging it up. The ring's not the sexiest bit of hardware we've ever seen, looking like nothing more than a utilitarian block of black plastic with a rubber wrap-around strap and a blue LED in the middle of its top surface. "Using the downloadable software, you can build complex control schemes by setting up six 'processes'"
The strap feels pretty tough, despite its thinness, though we can't comment on its perishability or general longevity. Thanks to the strap being fully openable and adjustable, the ring is attachable to any of your fingers or (average-sized) thumbs - or indeed, anything else of similar diameter. 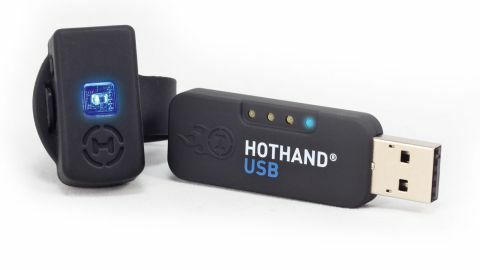 Getting up and running with the Hot Hand USB couldn't be easier. The USB receiver is class-compliant, so there's need to install any drivers, and after charging up the ring (which takes an hour and a half and gives six hours of life) you can simply hit the connect button, MIDI learn the three axes' default MIDI CCs in your target application and get to it, moving the ring around in the air to control up to three parameters at once. There's much more to it than just that, though. Using the downloadable software, you can build complex control schemes by setting up six "processes" (ring output data streams, customisable by axis, value range and centre, smoothing, depth and inversion) and assigning them to up to ten MIDI output modules. Each module can transmit MIDI CC, pitchbend or aftertouch data, continuously or triggered (for bypassing effects, etc), and assignments can be muted (and soloed), so 'crosstalk' between axes when mapping them is easily avoided. Setups can be 'burnt' to the USB receivers' 128 memory slots, recallable by Program Change messages. Mild strap durability concerns aside, live electronic musicians and performance artists will love the Hot Hand USB. The software is perfectly intuitive, setup is effortless, and it all works beautifully, translating your movements exactly as you'd expect.